das Blog: Exterminieren! Sie sind jetzt ein Gefangener der Daleks! Dr Who Series 4 Epsiode 13. 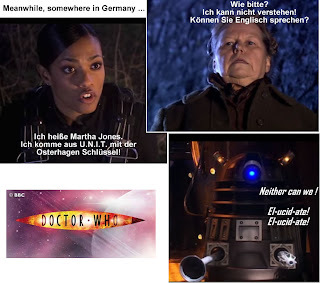 Oh excellent: German-talking Daleks! And so good of the Daleks to announce in the native language of the locals that they are about to be exterminated! Of course, there is not really such a verb in German as 'exterminieren'. My dictionary gives the correct verb as ausrotten, so the Dalek's really should have been shouting 'Rotten Sie aus!' (if they were being polite). I guess having attempted conquering the multi-verse they didn't have enough time to get to grips with separable verbs. Anyway, a thrilling action-packed final episode to a series that had it's high points (Silence in the Library/ Forest of the Dead) but was otherwise IMHO not as good as previous series. Russell T Davies presumably wanted to remind us of his legacy before he left, by bringing all his characters together and tying all the flapping story-lines up neatly. Perhaps too neatly, as the plot resolutions did seem very contrived. Davies has also left nothing for his successor Steven Moffat to pick up on to achieve a satisfying plot arc. Except that actor David Tennant is still the Doctor. Thank goodness he didn't regenerate as he was hyped to do. Well, not regenerate in the usual way (I knew that hand was going to be part of it!) and really it did seem like a deus ex machina (one of many in this episode!). Best of all though, finally and irrevocably we get rid of Catherine Tate! (And I said she was a Timelord! (well, not really)). Exterminieren (lat. ), über die Grenze weisen, des Landes verweisen; ausrotten; Extermination, Vertreibung; Ausrottung, Zerstörung. I can't read German, but that looks like it MIGHT be saying it is archaic ? In fact the "main meaning" of "Exterminieren" is "to expell so." But it's a quite uncommon word in the German language, so I guess anyone who hears it for the first time, will guess that it has the same meaning as "Exterminate". The best fitting translation of "Exterminate!" is "Ausrotten!" but that sounds... well stupid, so the current translation of the 2005-8 Series "Exterminate!" is "Eliminieren!" (Eliminate!). I'm quite curious if they will change now the translation. But I really prefer the original dubbing. Tennants German voice sounds a little bit too young, and Ecclestons didn't hit the sarcasm as good as the English. I think they've done a fantastic job translating the English 'exterminate' into the (slightly archaic but far more punchier than 'ausrotten' or 'vernichten') 'exterminieren'. Die Suche nach exterminieren in den Überschriften fand 1 Treffer. The Daleks should certainly not shout "Rotten Sie aus!" This would be an order "to exterminate" by the Daleks shouted at the humans - which means the humans get the order to exterminate (either the Daleks or each other) . The Daleks could shout "rottet sie aus", which means they are shouting to each other "exterminate them". Just using the verb "ausrotten" on its own is OK, but I think exterminieren is sooo much better, even though there is no such word in German, everybody would understand it and it is so Dalek like! Lots of fun! I stand corrected by what you have all said, and yes, actually I do prefer 'exterminieren' myself. I feel it interesting that of all the places in the world that could have been envisioned, daleks in Germany received prominence: the cold-blooded, mechanical extermination of all that are Unmenschen has resonances with the Nazi expurgation of Jews, gays, Roma, Jehovah's Witnesses, usw. Or is that too simplistic an interpretation?